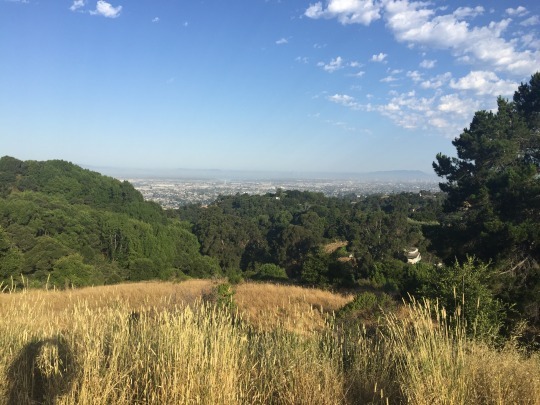 I recently returned from a quick 3-day trip (I guess 4 days if you count the drive up on Sunday night) to the Bay Area. 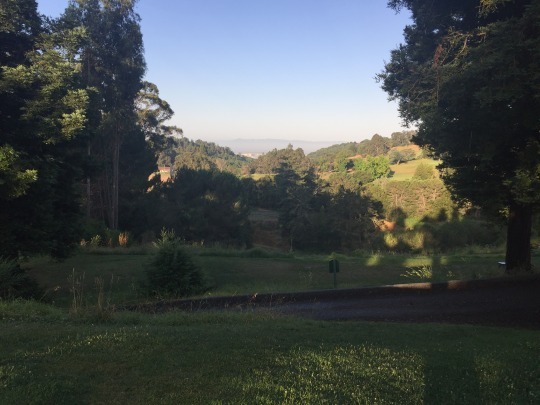 When all the smoke cleared, I played 12 courses, including a number of short courses in between the main rounds. This will end up being a 5-part series to cover all the rounds. 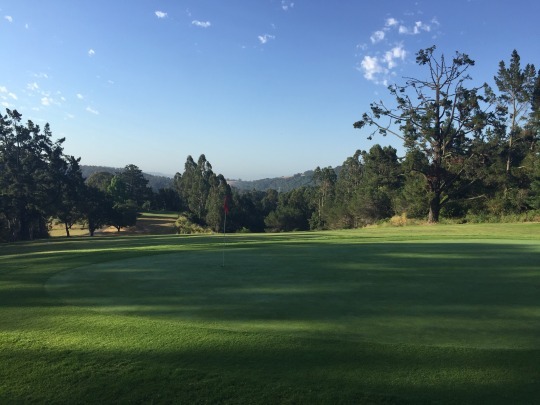 The main reason for the trip was to take advantage of an invite to play California Golf Club of San Francisco. I played that on Tuesday afternoon, right in the middle of the trip. It was an amazing experience, to say the least. However, that one will get its own review and you’ll have to wait for it. It will come last. This is a course that has always intrigued me, and I wanted to make it a point to play here on this trip. 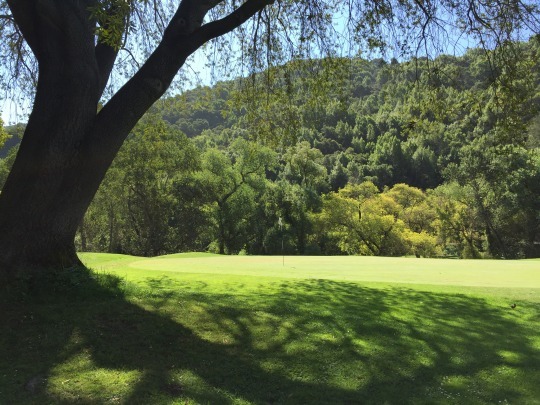 The main reason for the intrigue is the 18th hole, which is the only par-6 hole left in California. I’ve never played a par-6 on my travels and they are quite rare these days. 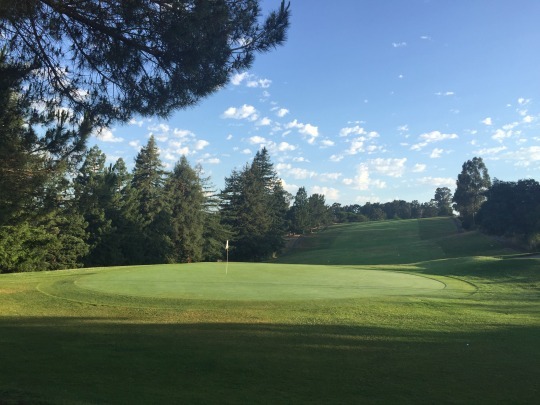 I know there used to be one at El Rivino down in Riverside, but that closed long before I had a chance to play it. 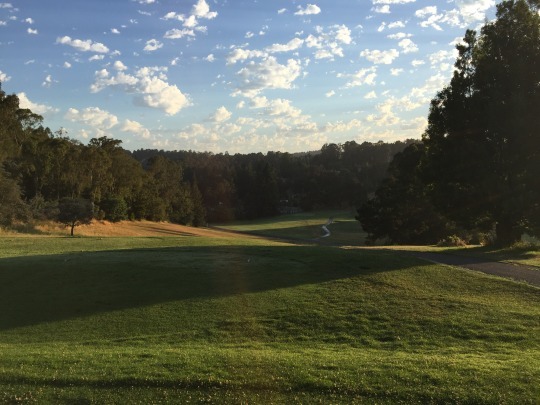 I booked a 6:34 tee time on GolfNow for $24, which turned out to be much cheaper than the $42 listed on the course’s website. I arrived early and the pro shop wasn’t open yet. They didn’t open up until a little after 6:00, but there wasn’t much of a crowd and I was able to get off first on my own for a very quick round. On my drive into the course, I was able to get a sneak preview of much of the front nine. In fact, this is perhaps the worst-designed entry road of any golf course I’ve played. The road goes right through the middle of a bunch of holes and will very much come into play. Luckily, I played on a slow day, so there weren’t many cars coming through while I played (and there weren’t too many golfers hitting as I drove out afterward). 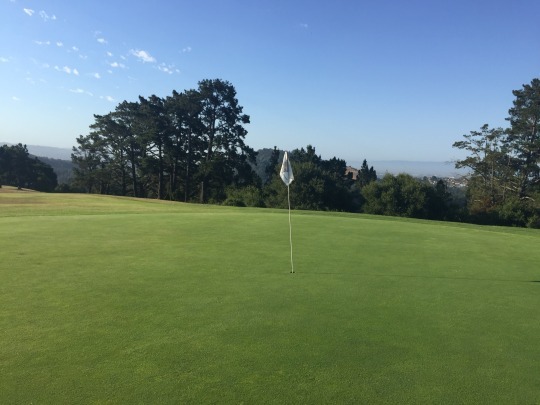 Otherwise, on a busy day it would be very uncomfortable for golfers teeing off on these holes and very dangerous for drivers coming or going from the clubhouse. It is a very strange set up for the road. The front nine where the road is in play is rather repetitive. 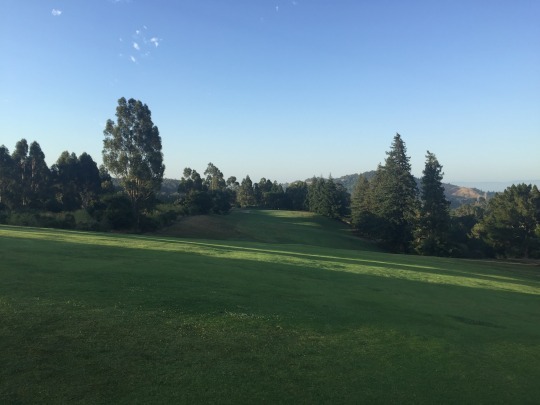 Most of these holes have a downhill tee shot over the road and then a steep climb back uphill for the approach. The holes definitely get a lot more interesting after this initial stretch. 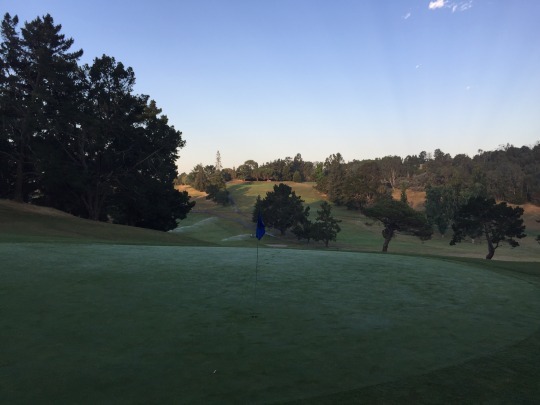 However, there is a predominance of uphill/semi-blind approach shots. Almost every green on the course is elevated. It can get tiresome. The one hole that helps make up for this is the par-3 9th, which is one of the most severe downhill par-3s I’ve ever seen. 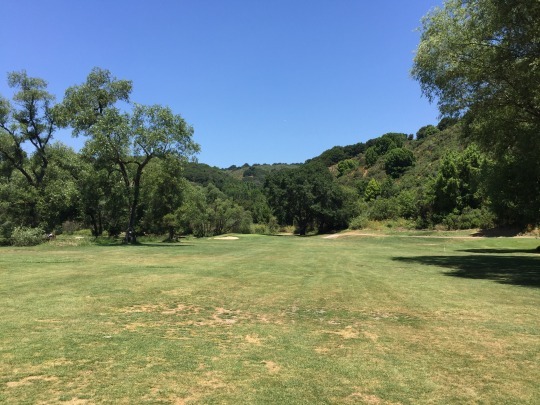 From the blue tees, it plays at 175 yards and is a completely blind shot down into a small canyon. There is a pole behind the green to give you an aiming point, but otherwise it’s just bombs away. Hit it and hope! 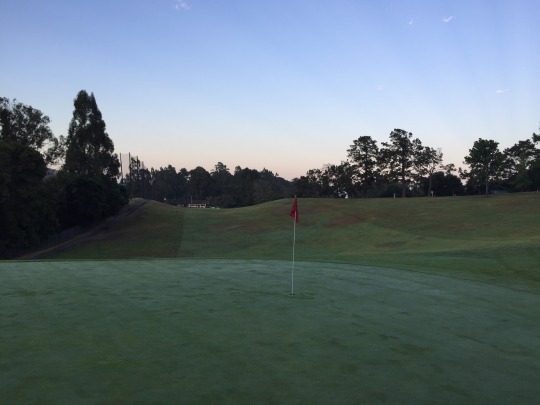 If you are playing the white tees, you can see at least part of the green, but it is still a tricky shot to judge. 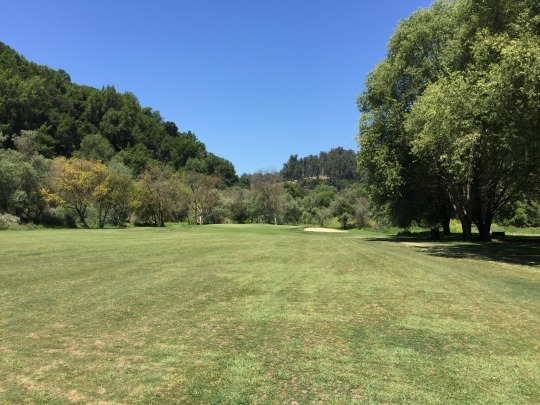 Beyond the initial repetitive stretch on the front nine, Lake Chabot is anything but boring. The course overall is not long, topping out at just 6,006 yards from the blue tees. 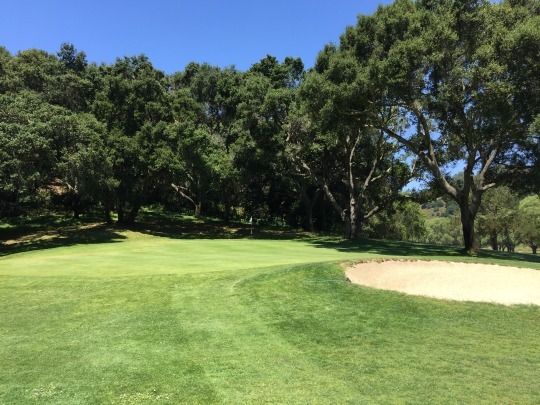 It is very hilly and tight with a lot of trees and steep slopes in play. It is definitely target golf, which I personally enjoy. The setting is also nice and secluded, and you are afforded some great views from the elevated greens. The setting definitely adds to the appeal here. With the morning sun and the elevated approaches where you can’t see much of anything, it was hard to get pictures. You’ll see most of my shots are from on or around the greens with the elevated vantage point. Not much else turned out. 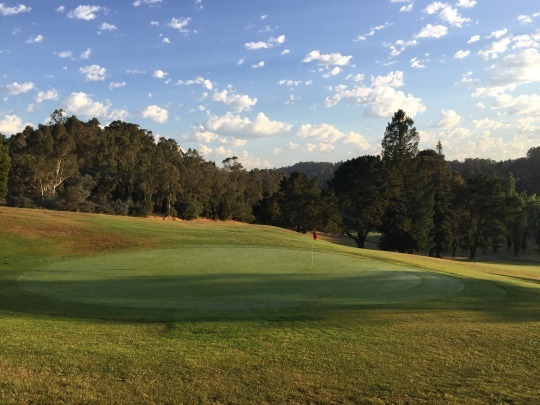 After a very fun middle stretch of holes, Lake Chabot culminates with its signature hole. I was excited to play the par-6 and see what it was all about. The 18th measures 667 yards from the blue tees. 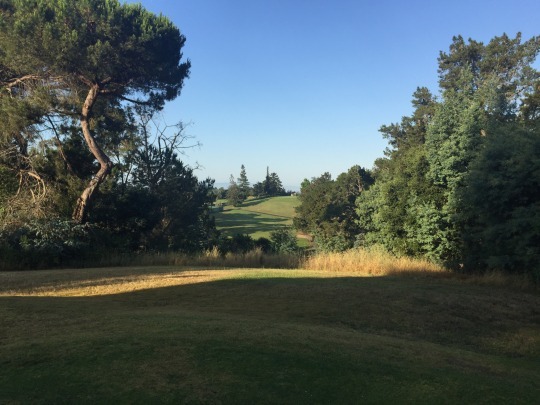 The tee shot is somewhat demanding with a slightly downhill shot and what feels like a narrow landing area. The fairway also slopes pretty hard from right to left. Then, the hole makes a sharp left turn straight down the hill. It is a steep drop-off with the cart path zig-zagging back and forth across it kind of like Lombard Street. I suppose that is for safety because a straight downhill path along one side or the other could get dangerous, especially in winter. 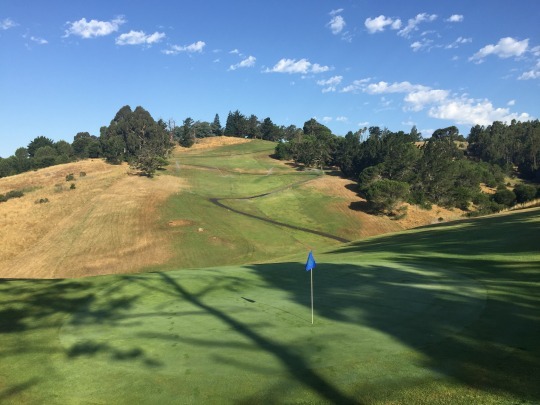 This steep drop runs all the way down until about the 100-yard marker and then the hole goes slightly back uphill for the approach shot to a two-tiered green. 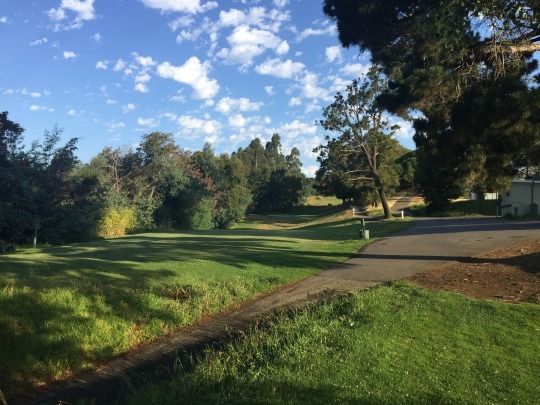 It’s great that Lake Chabot has this par-6 gimmick to market around, and based on the short overall distance of this course (only one of the three par-5s measures over 500 yards), I guess it makes relative sense here. However, I would argue by most standards it should be a par-5. I am not a long hitter. I hit a pretty good (not great) drive that ended up in the middle of the fairway up top. Then, I hit a really good 3-wood over the corner for my second shot. A maintenance worker was out there managing the sprinklers and luckily he saw where my ball ended up. It got hung up in the little bit of rough that lines the cart path that zig-zags across the fairway several times. 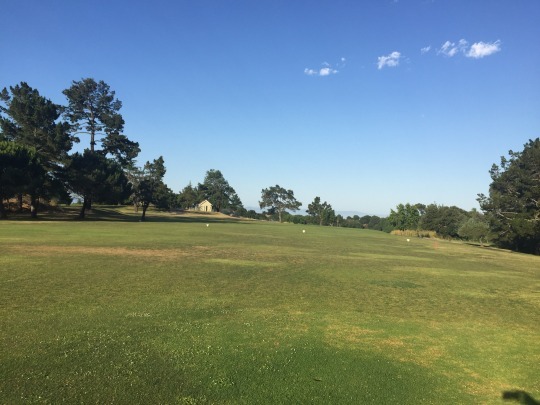 It is not much rough to stop your ball, but I think the combination of that and the freshly watered fairway was enough to slow my ball down to a stop. Even then, I ended up about 2/3 of the way down the hill and I only had 160 yards in for my third shot. 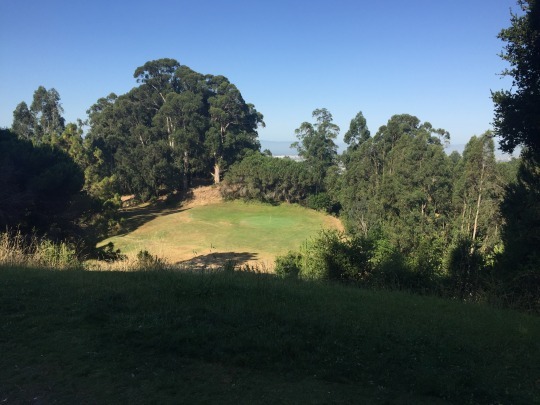 If my ball didn’t stop there, I might have easily gotten as far down as the 100-yard marker at the bottom of the hill. Of course, I still missed the green, wasn’t able to get up and down, and ended up with the most disappointing par ever! Either way, a short hitter like me shouldn’t have that easy a look at getting on the green in under regulation. I’m told that in the winter, when things are wet and soggier throughout the course, this hole definitely plays as a true par-6. You won’t get the same kind of roll-out you do in summer. 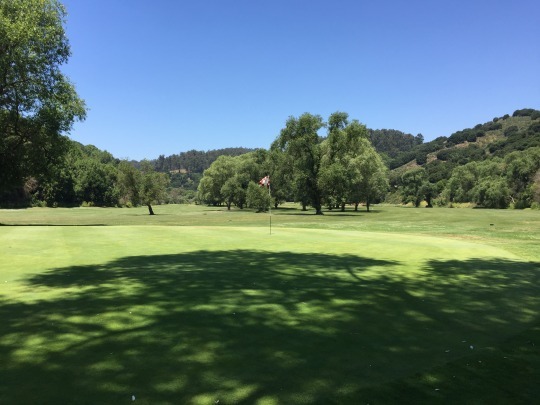 I actually think a really long hitter (a pro perhaps) could hit a big high draw (right-to-left shot) over the corner off the tee and get all the way down the hill, leaving just a short wedge in and a putt at double eagle. So, in some ways it’s a silly hole that is questionably rated as a par-6. 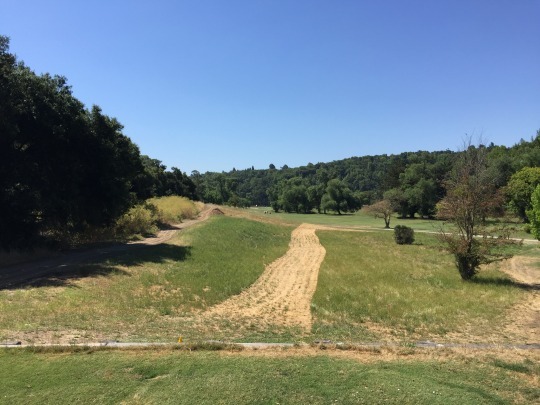 That said, it is a very fun hole design with the big dogleg and steep fairway drop. A lot of good and bad things could happen here. I happened to hit the ideal first two shots for my game, but it wouldn’t take much to make a complete mess of this hole. The course was in decent shape and it seems they are making an effort. They were doing a lot of watering on the fairways with sprinklers that I had to shuck and jive around at times. Some tee boxes were a bit unlevel, but fine enough. The fairways were inconsistent, but mostly lush and nice to hit from. The rough was more hit and miss. There are very few bunkers on this course (I think only a couple fairway bunkers I noticed and no greenside bunkers I can remember? ), so no comments there. The greens were soft and rolling medium/slow, getting quicker as they started to dry out. They were sometimes a bit bumpy and had a few bad spots here and there. They were not terrible, but not great either. 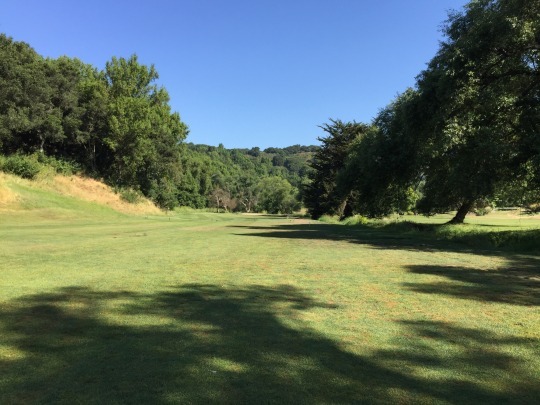 Whatever you think of the 18th, Lake Chabot ends up being a pretty fun layout. Keep it in play and you can post a really, really good score. Get offline just a bit and you will be hating life. It’s not a course everyone will enjoy, but I had fun there and I definitely liked the peaceful, secluded setting. 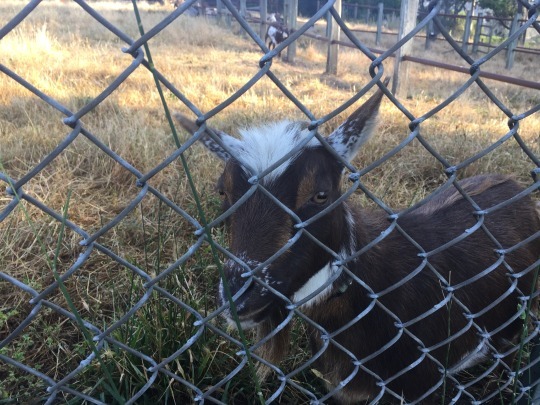 I saw wild deer and turkey roaming the course, and I also made friends with a couple goats that were in the yard of one of only a handful of houses that border the course. 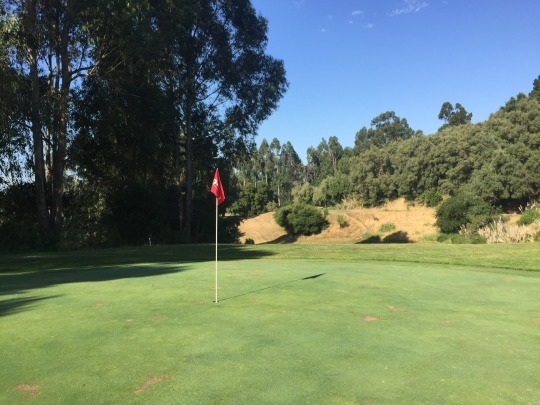 The short course at Lake Chabot is just a 9-hole par-3 track, but I wouldn’t necessarily call it a “pitch and putt.” The holes range from just 66 yards up to 162, so you actually get a pretty good mix of lengths. 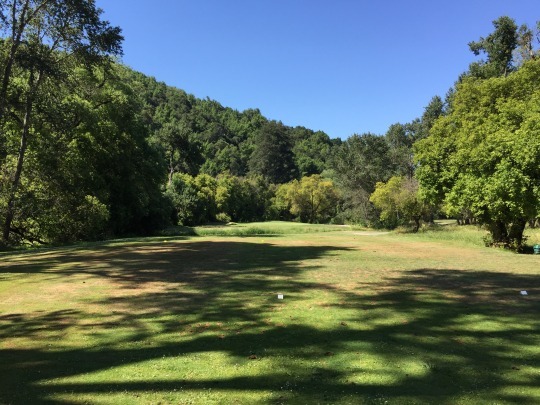 The Par 3 Course is walking only (cost me $11 to play) and also doubles as an 18-hole disc golf course (with two baskets near each green). I brought one of my discs just to throw a couple times. 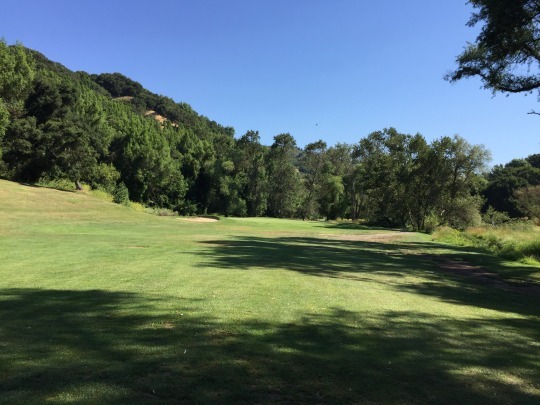 Though only nine holes, the course is a pretty good hike up and down some hills and along the edge of a canyon. 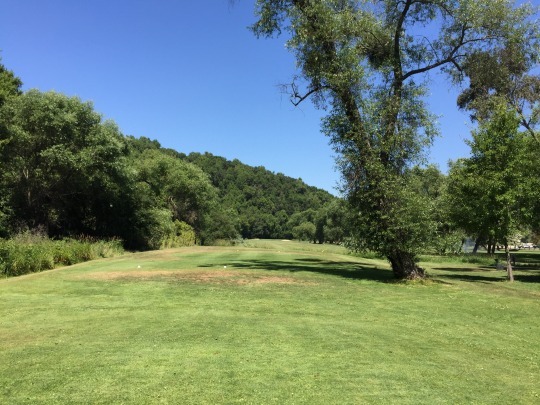 A few holes are pretty narrow from tee to green, as well. 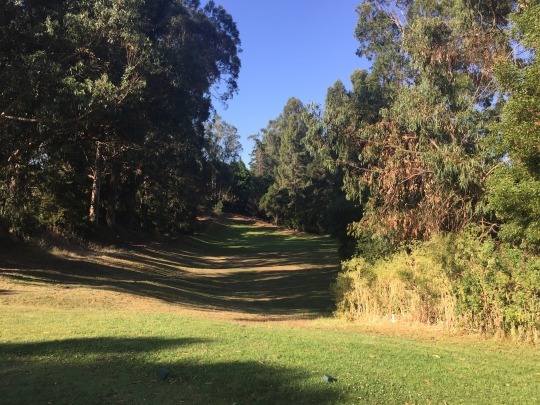 Then, the 4th hole is a fun one that plays straight downhill. Conditions were spottier on this side compared to the main course. The tee boxes were pretty chewed up and most of the areas in between the tees and greens were brown grass or just bare dirt. The greens themselves were decent enough, though probably a couple notches down from the other course. Everything was adequate enough for a short course of this caliber. 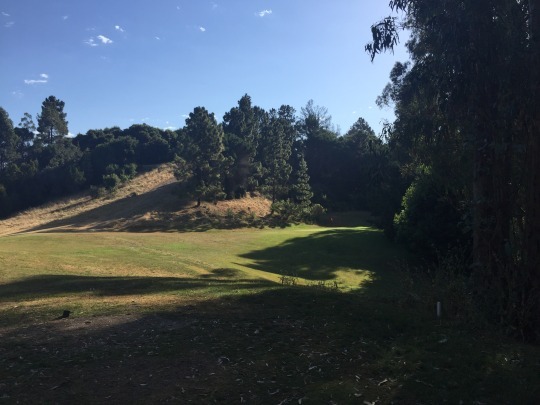 The short course at Lake Chabot is a fun side option or place to work on your short game, but not something that is worth too much trouble. Redwood Canyon is not far from Lake Chabot as the crow flies (it is just on the other side of the actual lake/recreation area). That’s the main reason I picked it for my next round. However, it is an indirect drive that will take 15-20 minutes. Redwood Canyon used to be called Willow Park. I am not sure why the name changed. I can definitely understand the “canyon” aspect because this whole course runs down through a beautiful little canyon area. I am not sure where the “redwood” name came from, as I didn’t see anything resembling a redwood tree around here. I made a 10:18 time online for $27, but the course wasn’t crowded at all on a Monday morning. I teed off by myself a little before 10:00. I caught some groups about halfway through the front nine. Ultimately, I joined up with the twosome ahead of me at the turn. The back nine went slower with a foursome in front of us that seemed to get more sluggish as the round went on. Still, it was only a 3:20 overall pace. 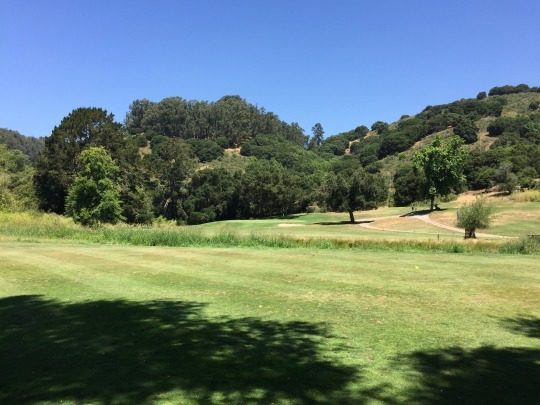 Like Lake Chabot, Redwood Canyon is not a long course. 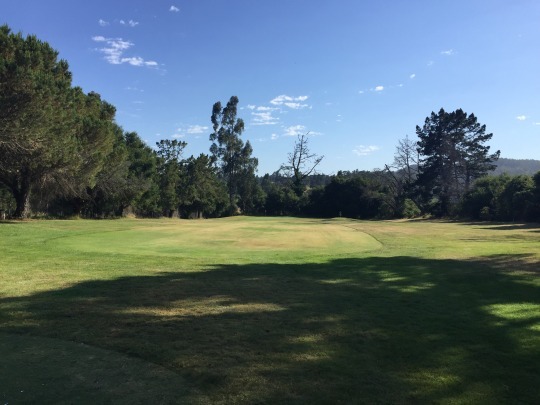 It is a par-71 that stretches out to only 5,801 from the blue tees. I would probably also consider it target-oriented, but not quite as demanding as Chabot. Despite the lack of any redwoods, the most appealing aspect of Redwood Canyon is the secluded canyon setting. It is very pretty and peaceful out there with no civilization anywhere around the course. 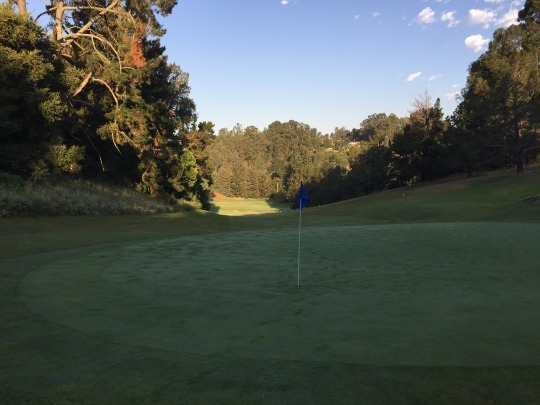 You are enveloped by the natural surroundings and it is a great backdrop for the course. 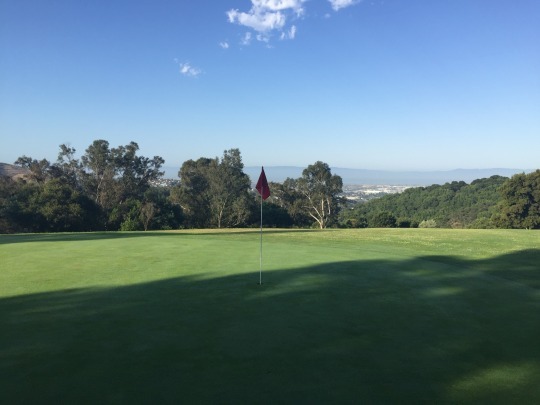 The course itself is just okay. Each nine goes out and back in different sides of the canyon, but there are no changes in elevation. It is pretty flat overall. 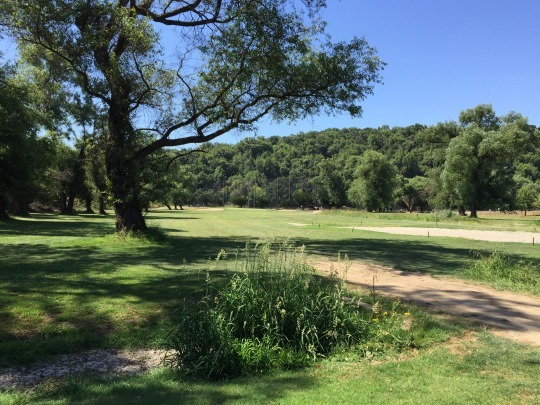 A creek runs down the middle of the front nine and can come into play a lot. There is a little less trouble to get into on the back nine. Trees definitely are a factor throughout the course. 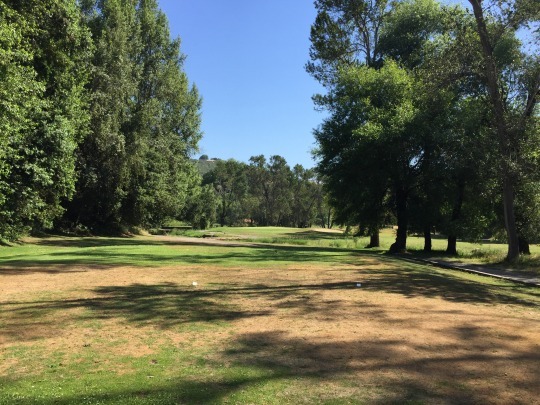 There are many big old trees that come into play and affect your shot decisions. 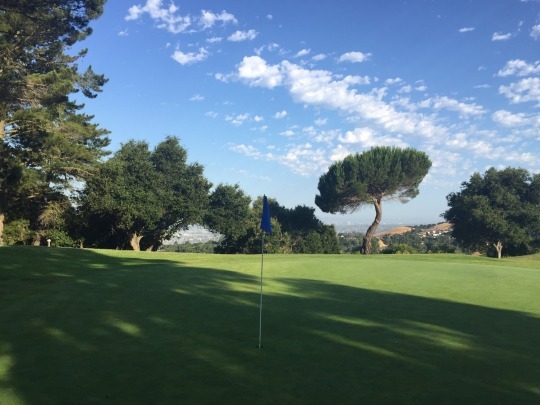 A number of front nine holes have trees guarding the front left of the greens, which I must say was a real nuisance for me trying to play my fades. 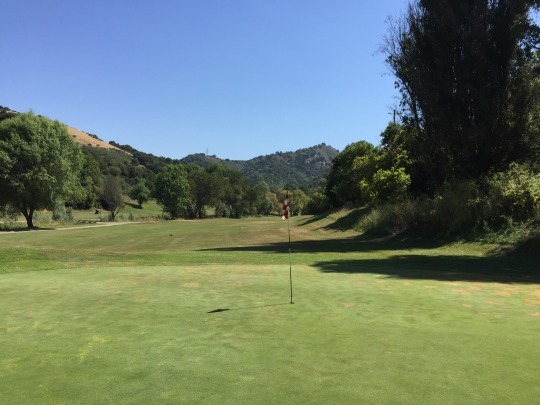 I don’t know if I would consider anything a signature hole at Redwood Canyon, but the best parts of the course are the two par-3s furthest away from the clubhouse on either end of the canyon. I’m talking about the 5th and 13th holes. 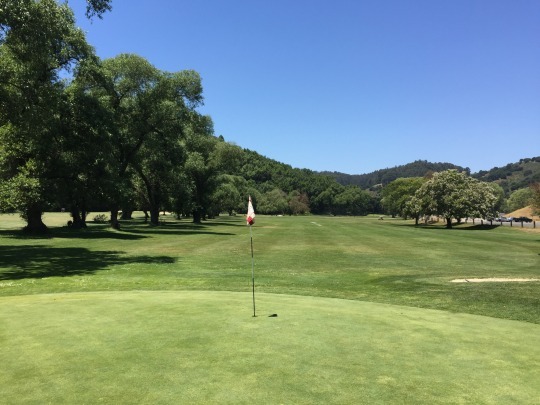 There isn’t anything overly distinctive about the holes themselves, but they are probably the two prettiest parts of the course because they are the most removed from anything resembling civilization. The course was in mediocre condition, to put it nicely. I would say consistently inconsistent. Many tee boxes were rock hard and it was difficult to get the tee in the ground. I suppose they were level enough, though. 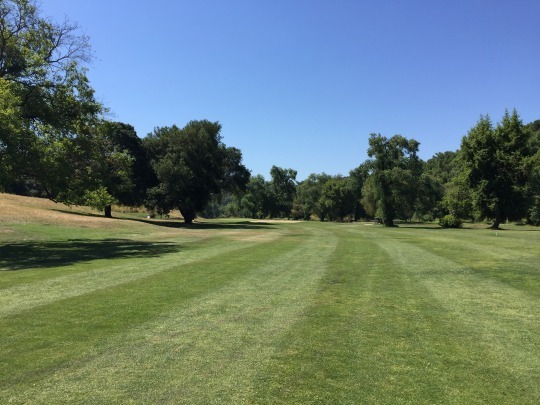 The fairways were kind of hodge podge of grass/weeds/hardpan/dirt/etc. and not always cut to consistent lengths. Some areas were pretty good and others were not so good. The rough was more of the same, but even spottier. I was in one bunker and it had very nice soft sand. The greens were soft-ish and rolling at medium/slow speeds. They were bumpy at times and had some ugly spots here and there. 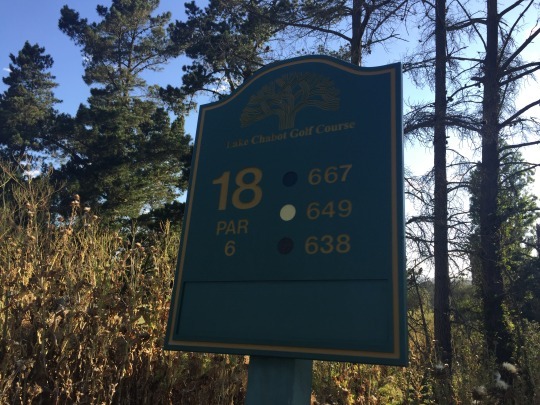 Of the two, I would definitely pick Lake Chabot. 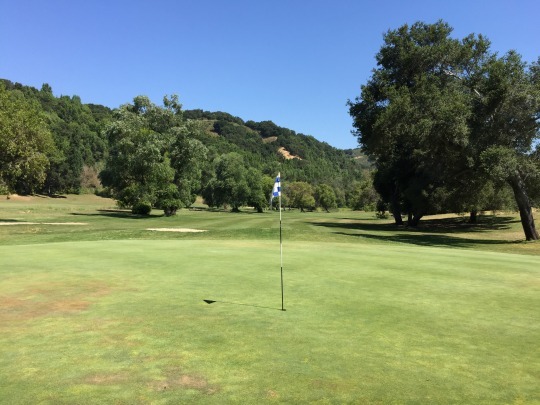 I loved the setting of Redwood Canyon more than anything about the course itself. Still, I had a fun time at both locations and the prices were reasonable. The seclusion each property provides is a welcome relief from the hustle and bustle of the Oakland/East Bay congestion.